This is the best video player and organizer for the iPad! This app syncs my video playlists on my iPad, something that iTunes no longer does. Thanks! I have been looking for so long for an app like this! Works like a charm! Thank you so much! Joobik Player is free to download! Joobik Player makes your iTunes video playlists available again on your iPhone, iPod, or iPad! It plays any unprotected video synced from iTunes to your device! Joobik Player lets you create your own custom Joobik Playlists on your iOS device! Add, remove, and rearrange videos as you like it! 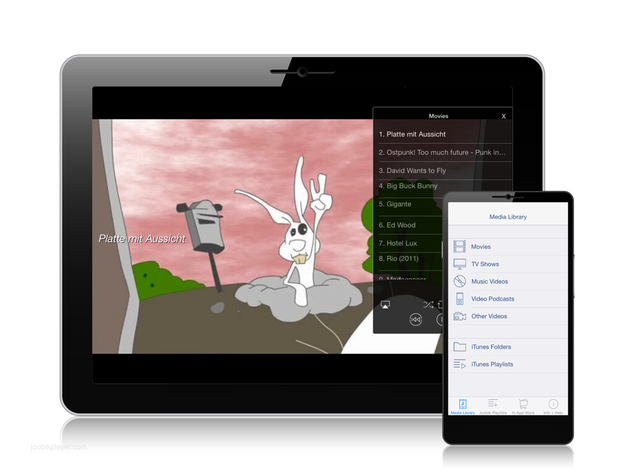 Joobik Video Playlist Player is an universal app, available for iPhone, iPod, and iPad!